How much selling power are you really getting from your sales teams? 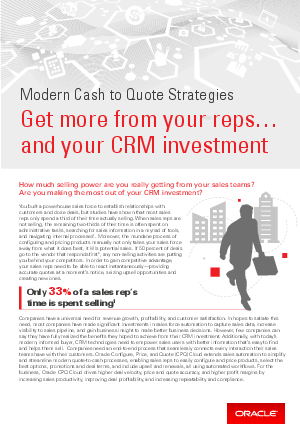 Are you making the most out of your CRM investment? Companies have a universal need for revenue growth, profitability, and customer satisfaction. In hopes to satiate this need, most companies have made significant investments in sales force automation to capture sales data, increase visibility to sales pipeline, and gain business insight to make better business decisions. However, few companies can say they have fully realized the benefits they hoped to achieve from their CRM investment. Additionally, with today’s modern, informed buyer, CRM technologies need to empower sales users with better information that’s easy to find and helps them sell. Companies need an end-to-end process that seamlessly connects every interaction their sales teams have with their customers. Oracle Configure, Price, and Quote (CPQ) Cloud extends sales automation to simplify and streamline modern quote-to-cash processes, enabling sales reps to easily configure and price products, select the best options, promotions and deal terms, and include upsell and renewals, all using automated workflows. For the business, Oracle CPQ Cloud drives higher deal velocity, price and quote accuracy, and higher profit margins by increasing sales productivity, improving deal profitability, and increasing repeatability and compliance.